Winding our way up the mountains from Licola into the Alpine National Park, the kids and I opened our car windows to inhale the intoxicating scent of rain on dry earth and leaf litter. It’s a smell that makes me giddy, I can’t explain why. It feels instinctual – connected with life and with nourishment. I wasn’t put off by starting our three day camping trip in the rain. This trip (as are all our camping trips) was about experiencing the natural elements and developing an appreciation for nature. Plus, we have camped often enough in the rain to know that it doesn’t stop children from having fun or adults from taking time out from busy schedules. Camping (and other nature based activities) for me is a time to reset. A peace settles over me that I only wish would last longer upon my return home. 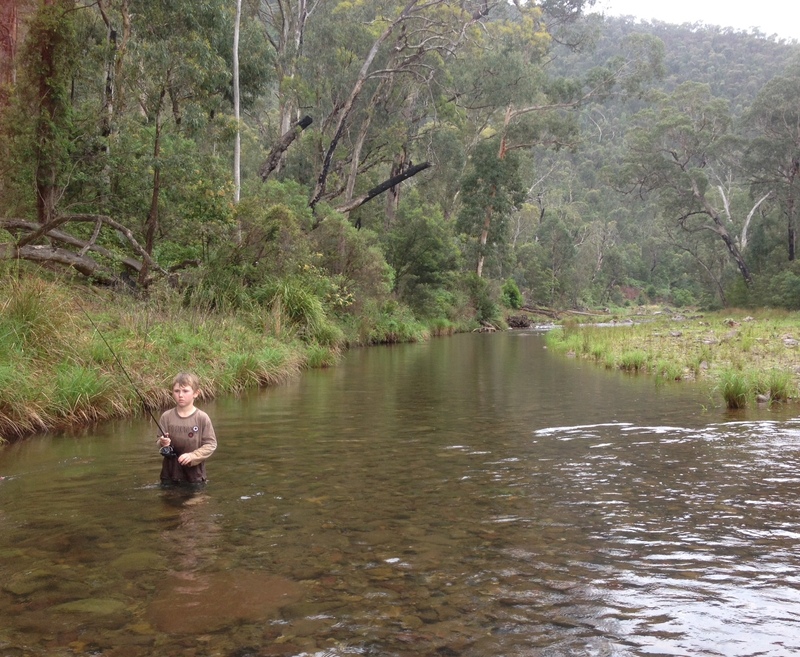 I believe being in nature has even more profound benefits for my young children. 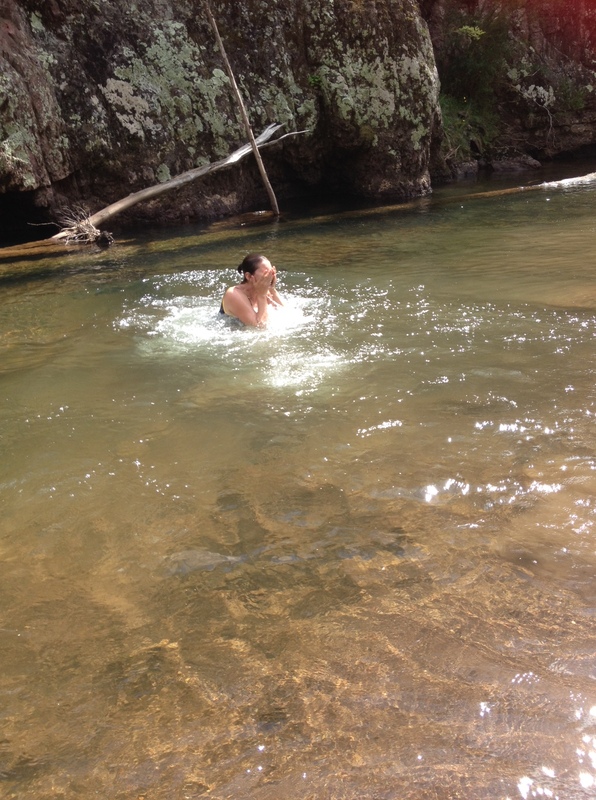 I took a dip in the river whilst the sun shone hot on our second day. Ainsley leaps from a slippery wet rock into the river. Nature gives children opportunities to learn what their bodies can do. My camping backpack of reusable kitchenware and other bits and pieces. Note how small my esky is. This is a list of all the things we took with us and some that we didn’t. We stayed at one campsite for three days with no facilities except a vented improved pit toilet within walking distance. The list might seem long but it packs up quite small, almost entirely into the boot of my car. 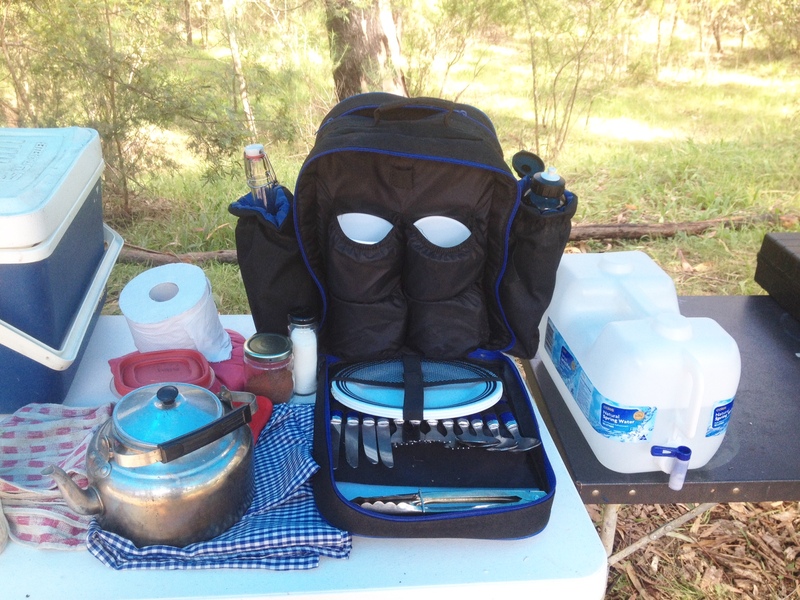 Because we camp as much as we can, we keep most things prepacked (like my kitchen backpack in the photo above). It means we don’t have to spend a lot of time thinking about what we need to bring each time. One roll of toilet paper, which is obviously composted in the pit toilet. Firewood collected from my parents farm. 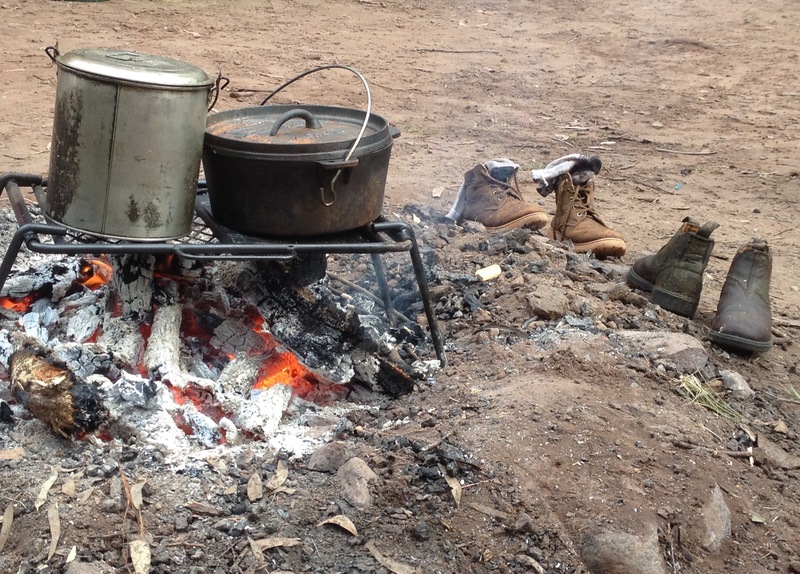 A fire was lit in the designated fire ring and used for warmth, cooking, heating water, drying clothing, socialising, and relaxing. No camp stove because I knew we would have a campfire. I wanted to make the most of having a fire because apparently they aren’t the most sustainable option for cooking. However, it may be that burning the wood releases a similar level of carbon as it would during the decaying process, making camp fires carbon neutral. If anyone knows more about this I’d love to hear from you. Esky, with reusable cold packs and ice blocks made at home. Our campfire turned out to be necessary for drying boots, chairs and clothing after the huge downpour and thunderstorm. My parents and my three sister’s families camped with us. The billy and pot in this photo are theirs, so the fire got a lot of use! I’ve listed the food separately as I think this is what generates the most waste whilst camping, although I’ve come to realise that some people plan to use all sorts of disposables for camping. This astounds me – for a start is there anything more annoying than trying to cut up your food on a disposable plate with a plastic knife and fork whilst resting it on your lap? Then you have to take all that rubbish out with you! 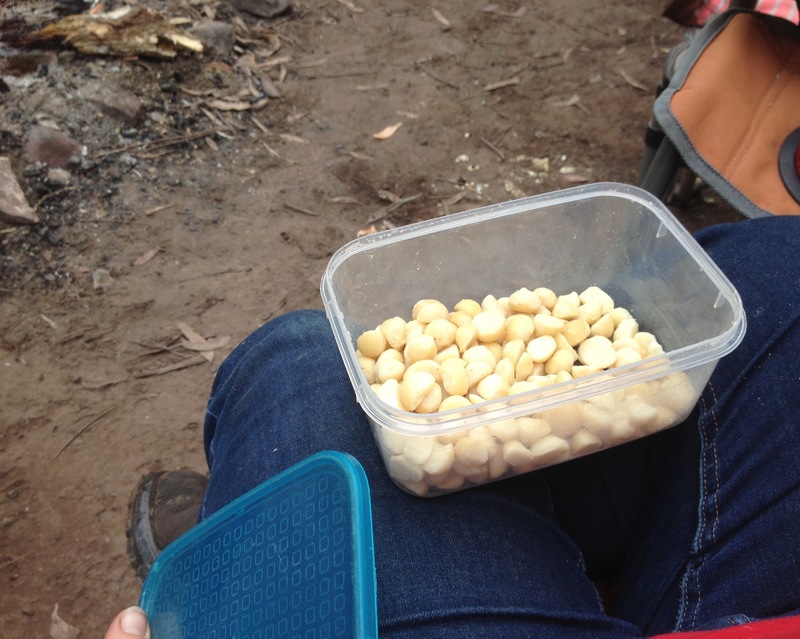 Snacking on some nuts between meals. I’d like to say that I came up with a fancy meal plan but I left it till the day before we left to organise and I hadn’t been shopping. Nevertheless, we ate good enough. Usually I would enjoy some alcoholic beverages late in the evening but I chose not to on this occasion. 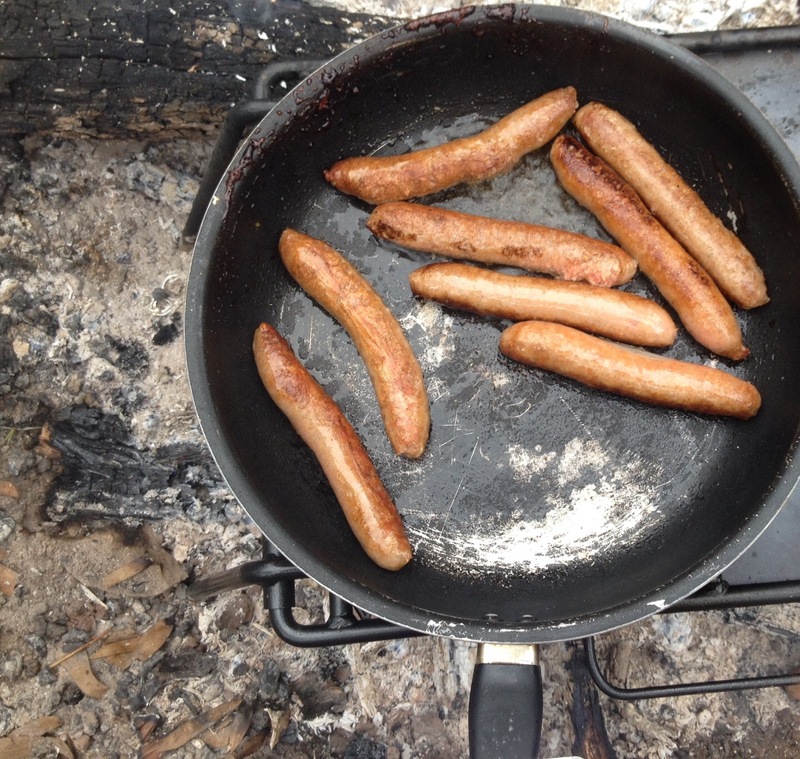 Sausages cooking over the fire. So that’s it, no waste. It might seem like a lot of weighty containers to pack but it’s actually not. Just choose the right sized containers for the amounts of food you need. Also, we weren’t hiking overnight so nothing needed to be carried more than 20metres from the car! Wash up as you go, like you would at home. That way all you do when you return home is pack the camping stuff away until next time. I’m so glad I severely limited screens and other forms of entertainment on this trip. The kids never had a dull moment and Alby was very determined not to leave. I was entertained just by watching them and helping them out now and again. There’s so much to share that I’m saving it for my next post (No Nature-Deficit Disorder here). 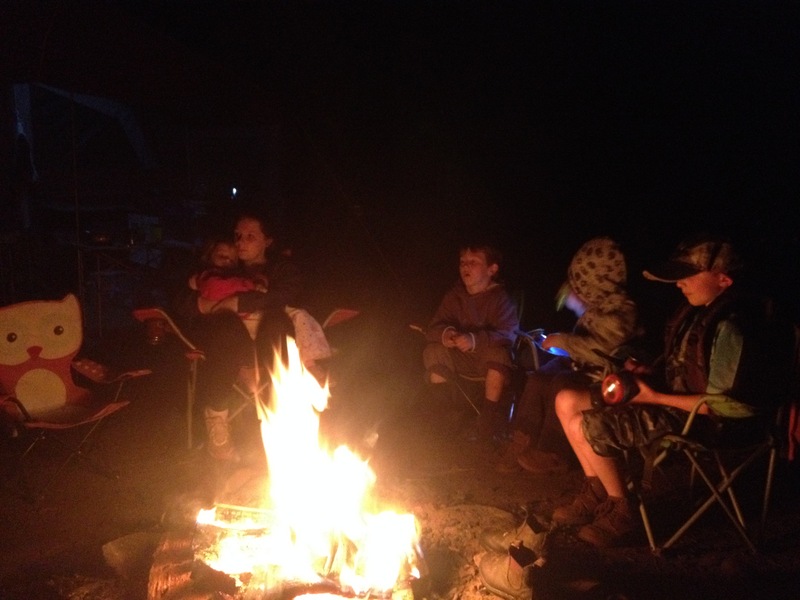 Kids around the campfire, a place to calm down, contemplate, tell stories, sing songs and belong to a tribe. Wow! Looks like a success, and way to prep that trip! How do your family respond to your actions. I get hassled about taking our reusable stuff from DH’s family when camping, but they camp where there are rubbish bins and just love dumping everything there. Hi Jess, over the years this has happened to me. I still get hassled by 1 or 2 people but I no longer care. It used to really bother me but now that I have taken a stance, they seemed have backed off and are even coming around. I’m hoping the community we create here will help people through these issues and let them know that they aren’t alone. Keep at it if you can. If you have kids they will learn from what you do. Great article! 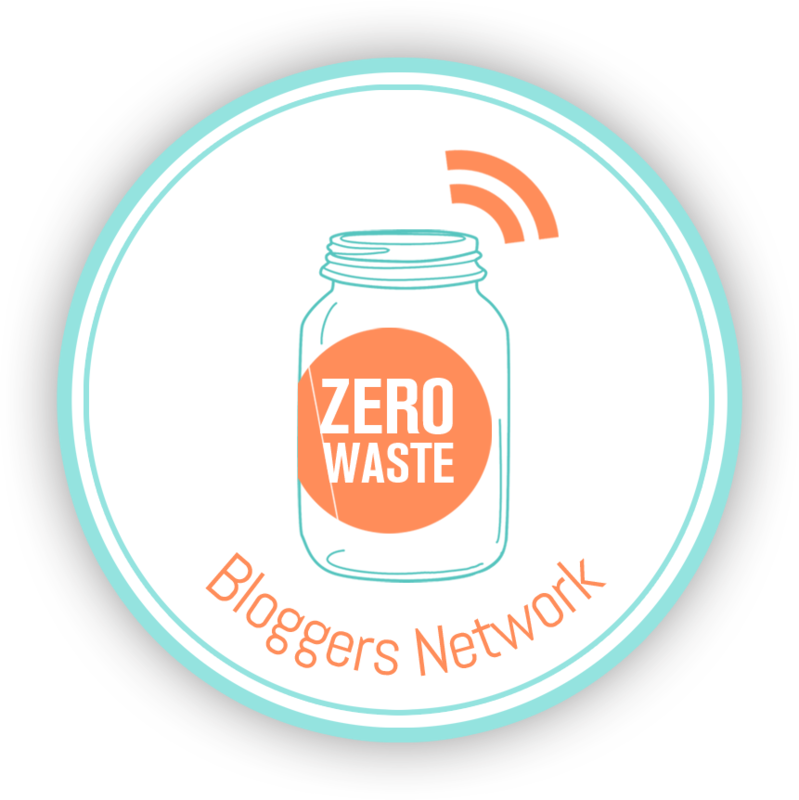 Do you know of any online resources for zero-waste pack hiking? 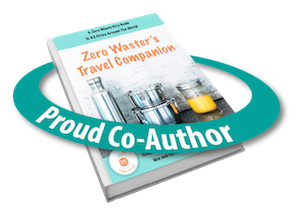 When every gram and inch of space counts, it’s too easy to use ziplock bags for everything, even if you cook and dry your own meals at home. Even though I re-use those ziplock bags many times over, as you know they break too easily and so become waste after a few uses. No I don’t at this stage but it is something I’ve had in the back of my mind for when I do a hike again. I’ll definitely post about it when I do. I know this is a couple of years late but you can now get reusable silicone zip lock vacuum seal bags. I can’t remember the brand but they have a hand pump to remove the air (no power or batteries required) so they pack really small even when full, and as they are silicone they are completely washable and reusable. Did you guys go to Licola? It looks like it. It is my favourite spot to camp. I’m trying to remember which time it was, I think November or Jan, but the river was full of tadpoles. The kids had a ball chasing them around and floating down the river. Im getting better with sustainable camping. I try to take along a bucket with a lid that we can then use as a ‘bin’. We generally go for a few days and there is some waste. Cans, etc. Sometimes we find dumped rubbish at campsites. I pick it up and take it home. We’re going up soon, I can’t wait! Yes, it’s Licola. We love that area too. Improvement each time is good! It’s really disappointed coming across campsites full of rubbish. I just don’t get who does that. My kids really want to go back to this spot but I just can’t find the time these days – I need to make the time!